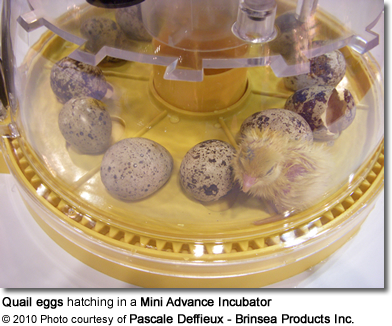 Useful Information: Breeders' Resources (covers everything from handfeeding to potential breeding / chick problems) ... Incubation Information ... Information on Housing Chicks, Temperature Requirements, etc. 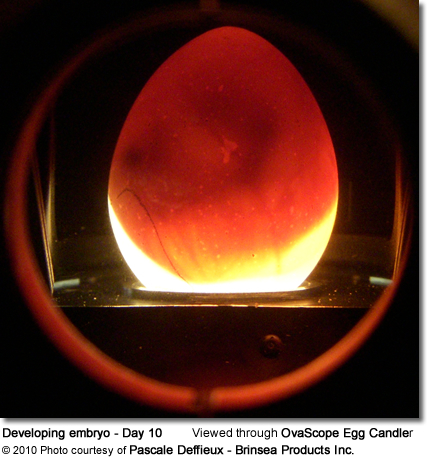 The first feature visible in an egg is a pointed, thickened layer of cells at the tail end of the embryo - from which the head and backbone form.The cardiovascular system, beak, limbs and respiratory system appear next.The claws and feathers are the last to develop. 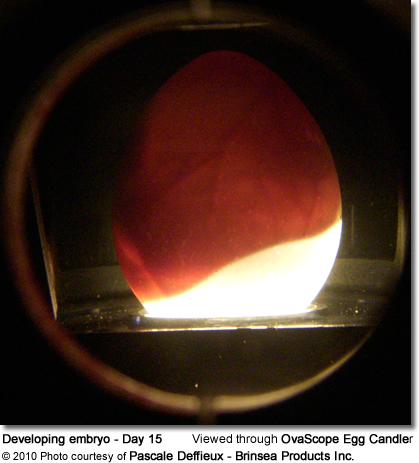 The exchange of oxygen and carbon dioxide gas occurs through the eggshell; the chorion lines the inside surface of the egg and is connected to the blood vessels of the embryo.The yolk is the primary food source for the growing embryo. This nutrient-dense fluid consists of 21 - 36% lipids and 16 - 22% proteins (with the rest being water). It also contains maternal antibodies (deposited during yolk formation) that strengthen the immune responsiveness of the chicks. The yolk is suspended in the center of the egg by twisted strands of protein fibers called chalazae.Waste products collect in a sack (allantois). The egg's air cell expands to approximately 30% of the internal volume of the egg.After the chick pierces the air cell with its beak, pulmonary respiration commences. The inhaling of air from the air cell is known as 'internal pipping'. The trigger for it is an increase in carbon dioxide in the blood. 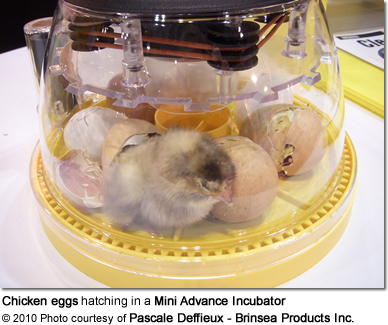 It usually takes 24 hours from internal pip to a completed hatch. Air Cell (AC): Empty space located at the large end of the egg; it is between the inner and outer shell membranes. Air Sac / Allantois Sac: Grows larger as embryo grows. Permits respiration (exchange of oxygen and carbon dioxide) and excretion. Amnion: Surrounds only the embryo inner layer of cells. It secretes amniotic fluid in which the embryo floats. The fluid protects the embryo and prevents it from drying out. Chalaza (pl. chalazae): A spiral, rope-like strand that anchors the yolk in the thick egg white. There are 2 chalazae anchoring each yolk - one on the top and one on the bottom. Chorion: Surrounds all embryonic structures. Serves as a protective membrane. Germinal Disc or Blastodisc: It's a small, circular, white spot (2-3 mm across) on the surface of the yolk; it is where the sperm enters the egg. The nucleus of the egg is in the germinal disc. Shell Membranes: The shell's inner and outer shell membranes protect the egg from bacterial invasion and help prevent rapid evaporation of moisture from the egg. Shell: The hard, protective coating of the egg. It is semi-permeable; it lets gas exchange occur, but keeps other substances from entering the egg. The shell is made of calcium carbonate. Inner Shell Membrane: The thin membrane located between the outer shell membrane and the albumin. Outer Shell Membrane: The thin membrane located just inside the shell. Vitelline Sac or Yolk Sac: The membranous sac that lies ventral (towards the abdomen) to the embryo. It probably assists in transporting nutrients to the early embryo and is one of the first sites where blood cells are formed. 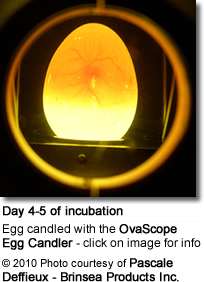 Yolk: The yellow fluid inside the egg where the embryo will form. The nutrient-dense yolkfeeds the embryo as it grows. YSM: Yolk Sac Membrane (YSM): An extraembryonic membrane that encloses the yolk of eggs and circulates nourishment from the yolk to the developing embryo.